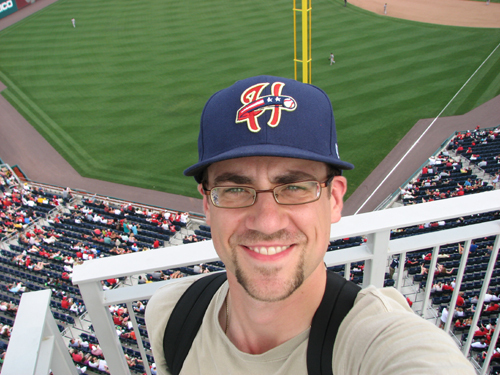 Last week, I blogged about the six caps I’ve bought during my travels around Major League and Minor League Baseball. 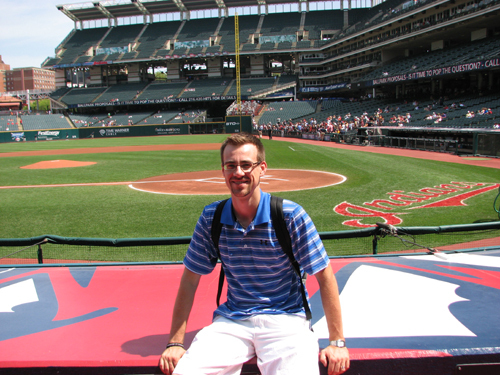 This week, I want to continue the sports-centered wardrobe theme and talk about some of the shirts I’ve bought and received through stadium giveaways. 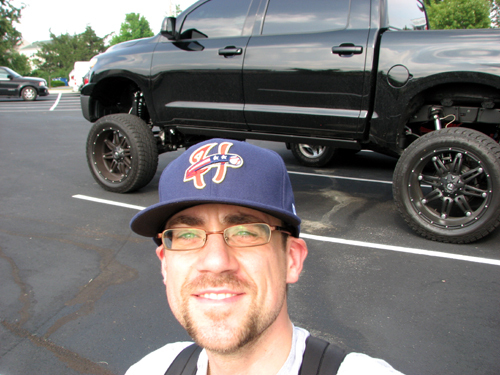 As I’ve said, I don’t buy a hat at every park I visit. The same holds true for shirts and other memorabilia. Still, when the price is right and I like the look of something, I’ll add it to my collection. 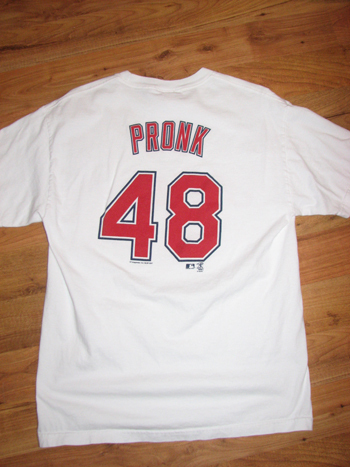 This isn’t a traditional jersey shirt; you’ll see that it has Hafner’s nickname, Pronk, on the back. 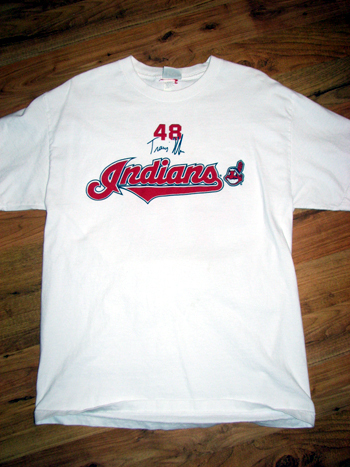 I’m a Hafner fan, and thought this shirt was unique. 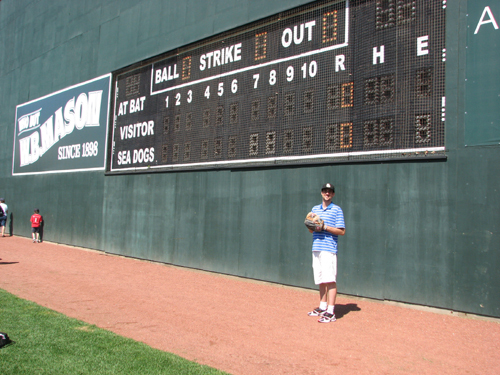 When I visited New Hampshire’s (now called Northeast Delta Dental Stadium) in September 2010, the team was about to play what would be its final playoff game of the season. 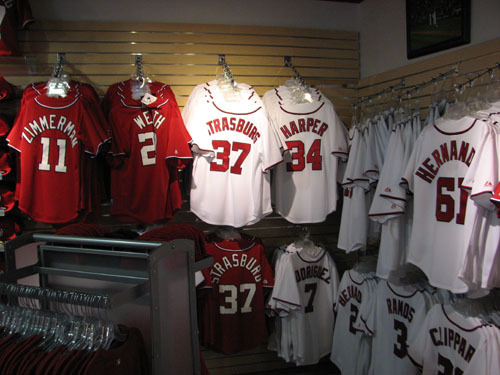 As such, most of the products in the team shop were on sale. 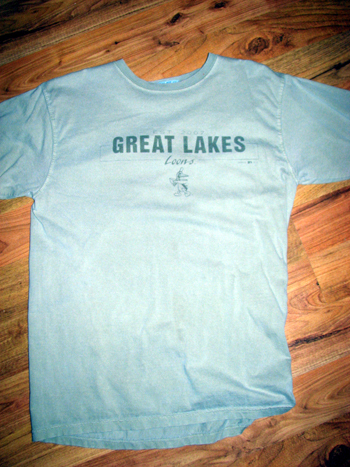 I picked up this T-shirt for under $10. I got this one for around $10, too. Not bad for a Nike product, and I like the look of it. 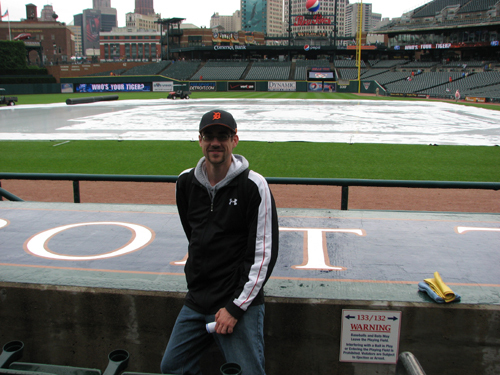 When I watched the Great Lakes Loons play in May 2011, I visited the team shop during a long rain delay. This shirt was priced way less than other comparable products, so I bought it. 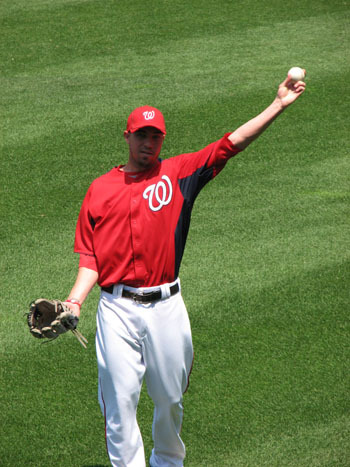 What I didn’t notice at the time is that the logo is significantly closer to the left sleeve. (Hence the price reduction.) 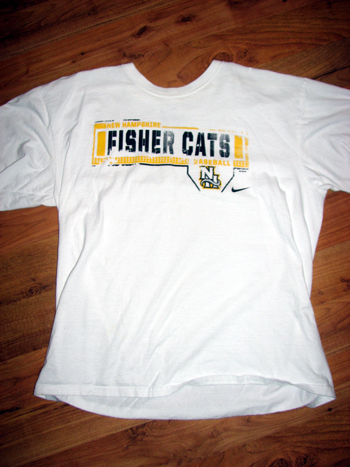 Still, I like this shirt because it’s one baseball shirt that isn’t gaudy. 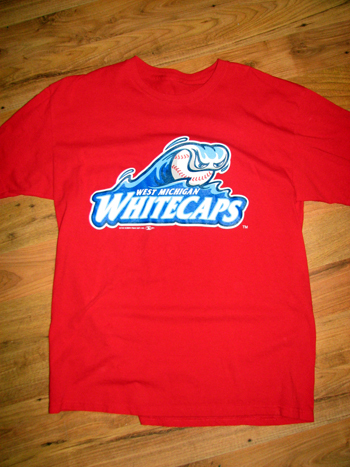 Speaking of gaudy (in a good way, of course), this bright red Whitecaps shirt featuring their logo is eye catching. Most of the shirts I’ve gotten are white, so this one stands out in my closet. 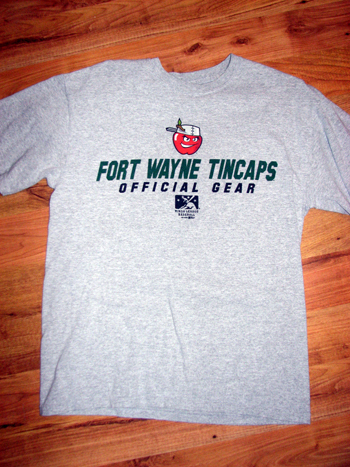 Perhaps partly influenced by my amazing visit to beautiful Parkview Field, this TinCaps shirt is one of my favorites. 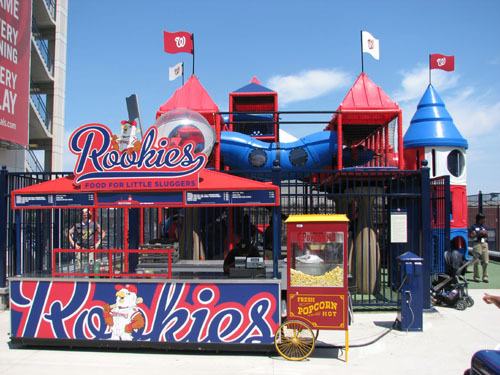 I like its design and the fact it uses the MiLB logo in a prominent spot. 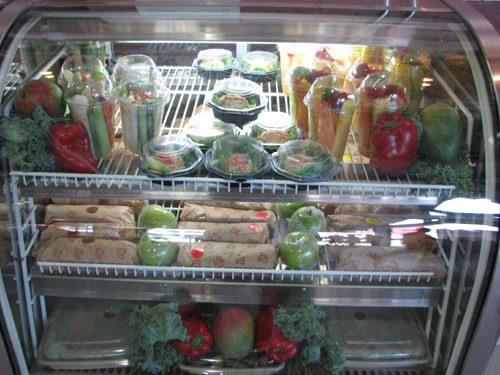 Plus, who doesn’t like angry apples? 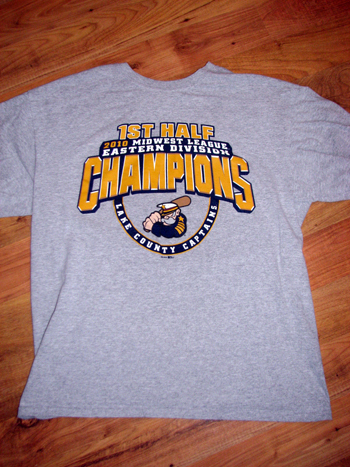 I wasn’t around to see Lake County win the first half of the Midwest League championship in 2010, but I liked this shirt enough to buy it in 2011. 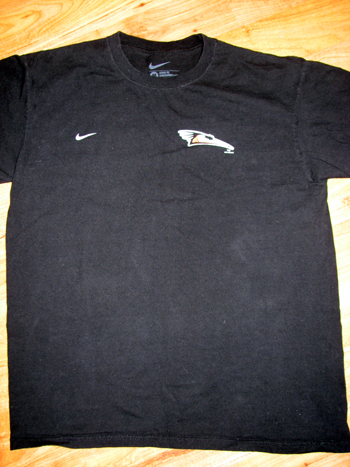 I’m a big fan of this simple Shorebirds T-shirt by Nike. I like Delmarva’s logo and the simple design of this shirt. 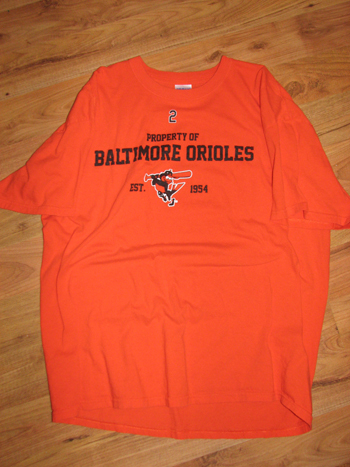 When I was in B-More, I was lucky enough to attend a game with a T-shirt giveaway. 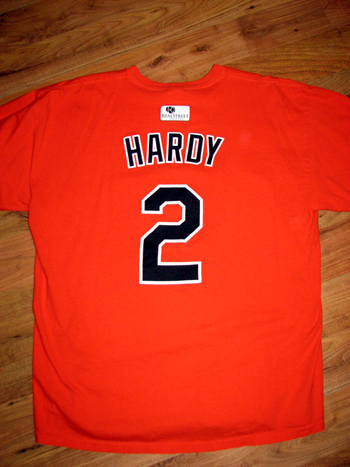 The T-shirt this day was J.J. Hardy. 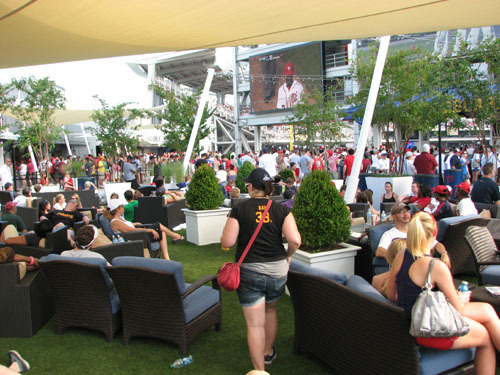 Last summer, Chevrolet heavily promoted the Volt at MLB stadiums, including Camden Yards. If you signed up to receive Chevrolet marketing material, you got a free T-shirt. Count me in! 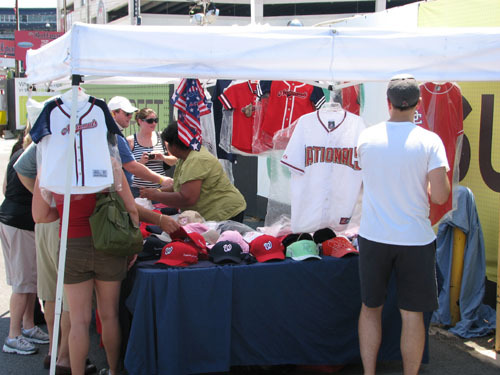 And, if you wanted to sign up multiple times, you’d get multiple shirts …. 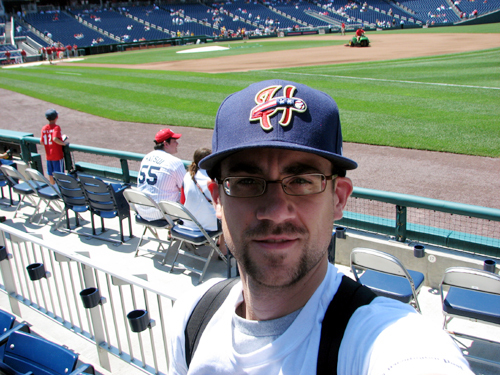 A couple days after I was in Baltimore, I was in the nation’s capital over the July 4 long weekend. 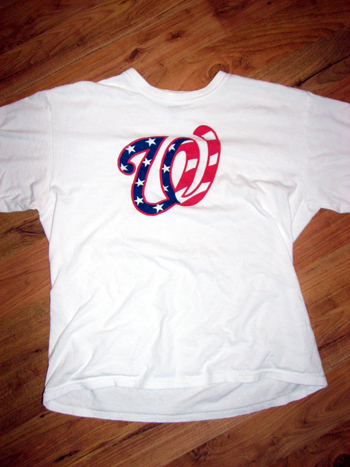 The Nats gave away American flag-themed T-shirts at the gate. Just like in Baltimore, Chevrolet had a kiosk promoting the Volt. 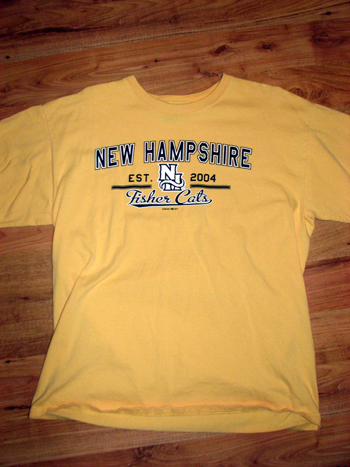 I managed to get, uh, a few of these shirts, too. 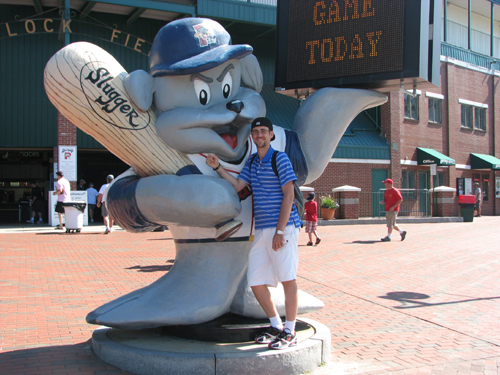 On July 4, I stopped in Binghamton to see the B-Mets battle the Portland Sea Dogs before an impressive fireworks show at NYSEG Stadium. 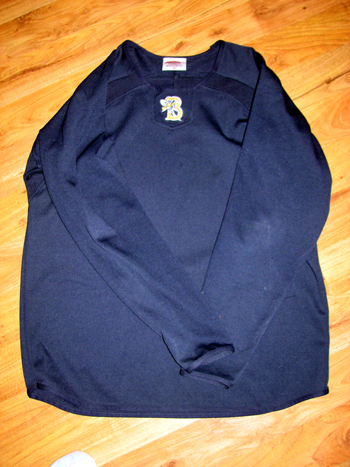 During the game, I picked up what’s become one of my favorite items — a B-Mets pullover. These are the shirts the players wear during BP, in the dugout and while warming up. It’s awesome. But what about game-used items? You’ll just have to check back tomorrow for some goodies that fall under that category. 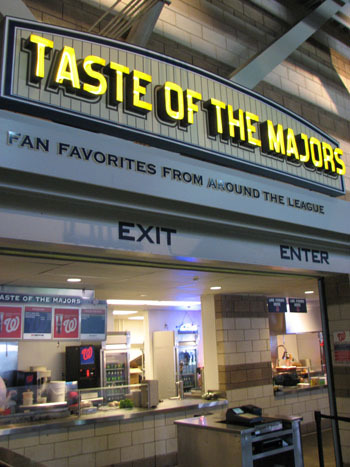 I’m a huge fan of taking in the entire ballpark experience every time I watch a game. 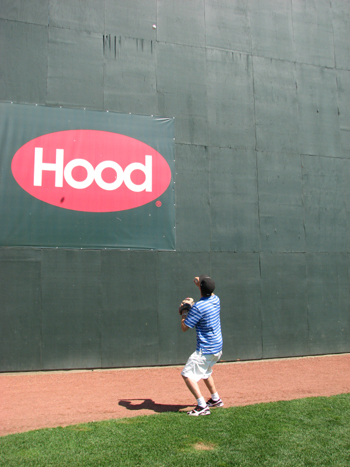 For me, this typically means trying to snag a foul ball, getting a handful of autographs and eating some unique food. 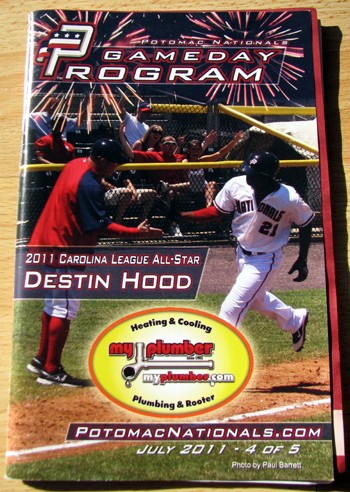 It also includes grabbing a game program and checking out what it has to offer. My stipulation, however, is that I rarely get programs if you have to pay for them. I’m not big on paying for something I’ll likely only flip through once, and if I buy one, I’m less likely to want to throw it out later. 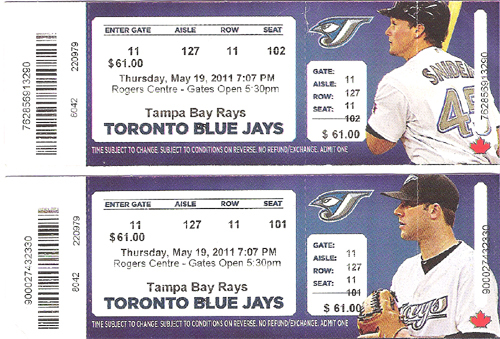 I don’t have programs from every ballpark I’ve visited, but I have a handful that range from amazing to bland. Here’s a look at them. 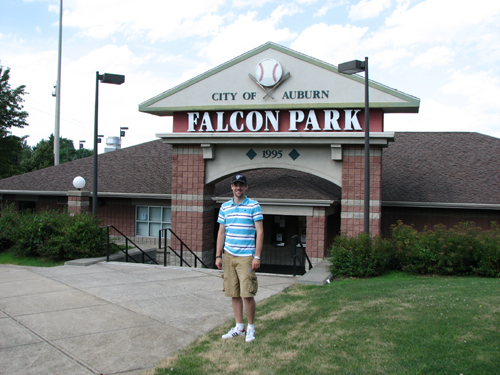 For a Short-Season A franchise, Aberdeen’s “First Pitch” program has a lot to offer. 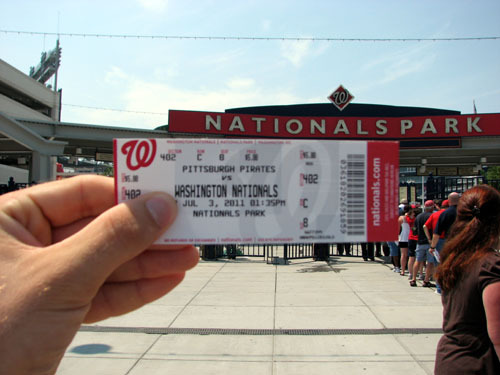 For one, it’s printed specifically for the game you’re attending. 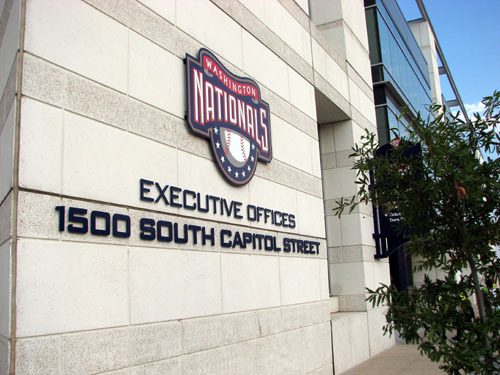 (Most teams print programs per series, week or homestand.) It’s got a clean, attractive cover and a preview of the night’s game. Because the program is printed for each game, all the standings and stats are up to date, which is a huge bonus for a stats guy like me. 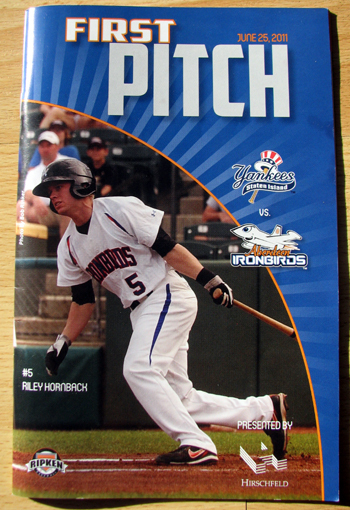 A couple standout features in this edition of “First Pitch” were a list of IronBirds with Twitter accounts and a well-illustrated diagram of pitcher Aaron Wirsch’s four pitches, along with commentary from the pitcher himself. 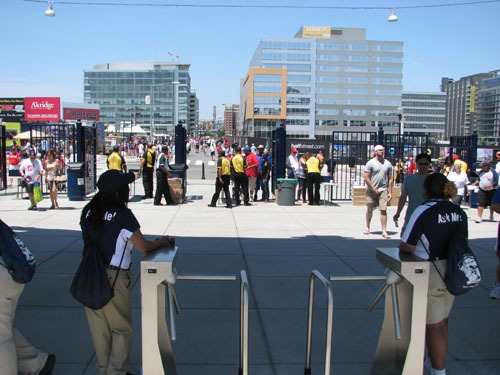 Baltimore’s AA franchise in Bowie provides a program called “Baywatch” for each home series. 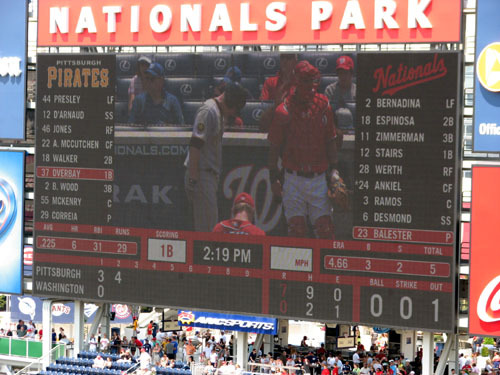 This one had a decent fan guide to Prince George’s Stadium, a list of former Baysox who’ve made the Major Leagues and a discussion between the team’s infielders on turning a double play. 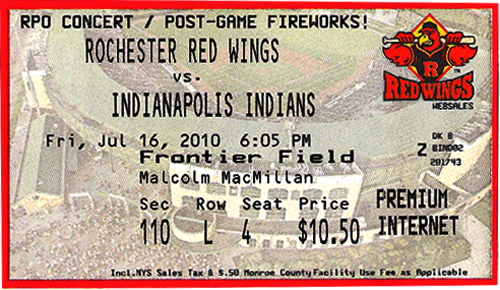 The Indians’ “Batter Up!” is given out free and printed for each series. 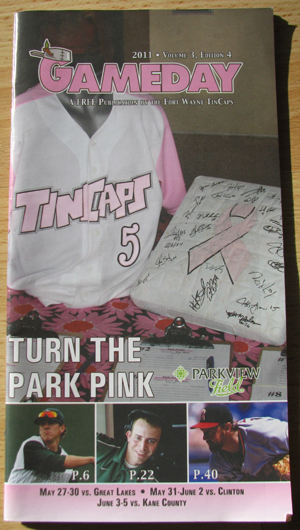 Of course, you can also buy a more in-depth game program, but this one’s worth picking up. 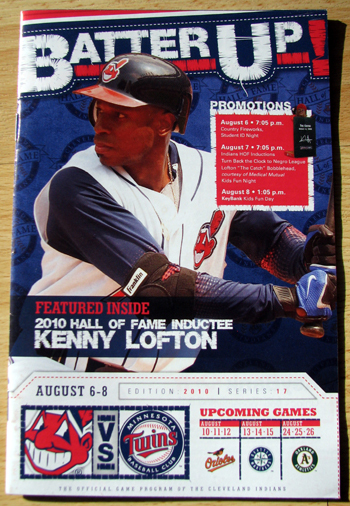 It’s got a good concession directory, a fan guide to Progressive Field and a couple interesting articles. 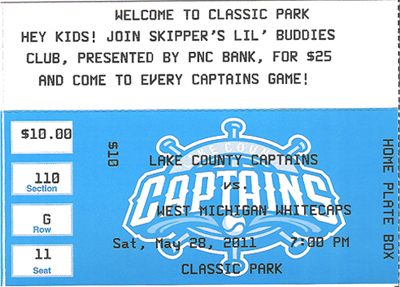 I was also impressed with the full-page ad for Cleveland’s Midwest League affiliate, the Lake County Captains, who play just 15 minutes outside of C-Town. 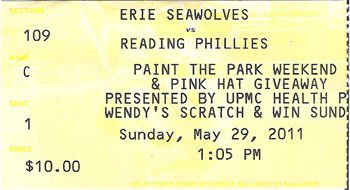 A South Atlantic League franchise, the Shorebirds program “Play Ball” is one of the shortest I’ve seen. 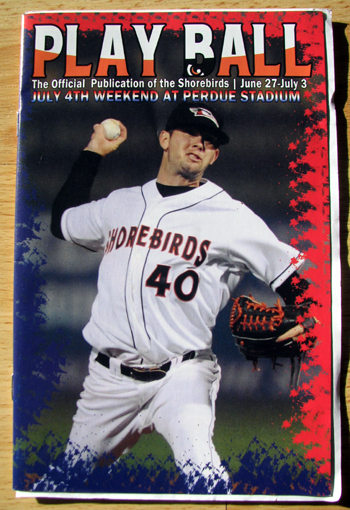 Still, it contains a couple interesting stories on Shorebirds players, a decent look at the team’s opponents and a nice, comprehensive breakdown of each team in the Baltimore Orioles system. 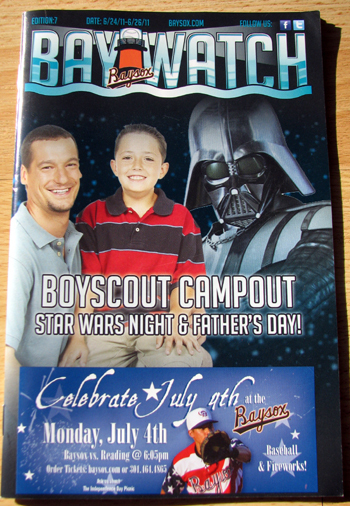 Fort Wayne’s “Gameday” program is printed each homestand, which is pretty much the norm in the Minor Leagues. 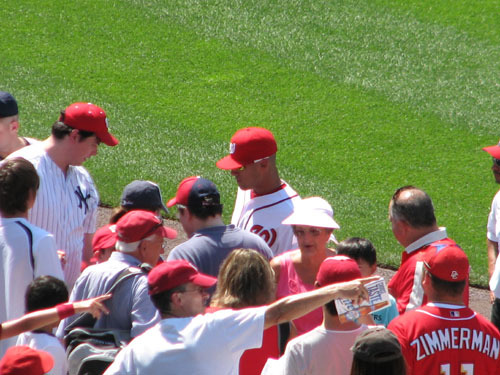 This one had pink as a dominant color, given the theme of the team’s homestand, Turn the Park Pink for breast cancer awareness. 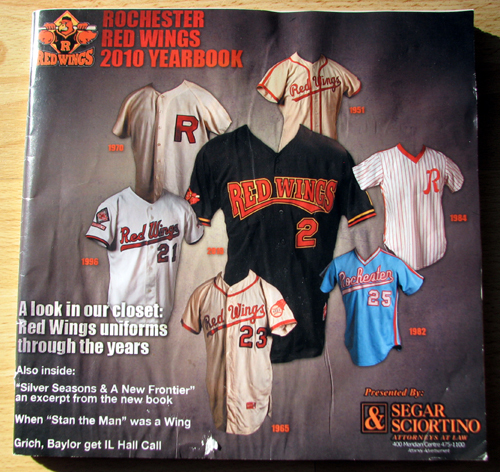 This program featured a thorough, five-page guide to Parkview Field’s food and interesting features such as a tutorial on how to score a game, a map showing the location of each Midwest League franchise and a couple articles about the National Baseball Hall of Fame. 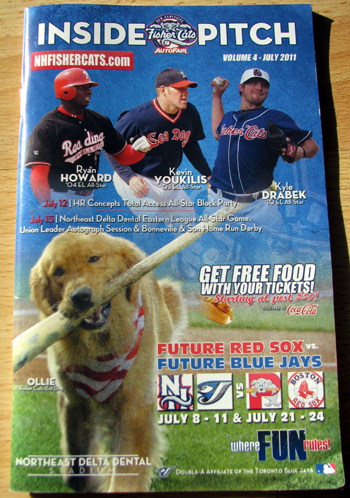 New Hampshire offers an amazing fan experience, but there wasn’t anything to write home about in the “Inside Pitch” free program. The schedules, stats, rosters and promotional schedules were all handy, but they’re all things you’d expect to find here. The worst part was the ads, even though I know they’re necessary. Early in the program, 22 out of 23 straight pages were full ads. Ugh. 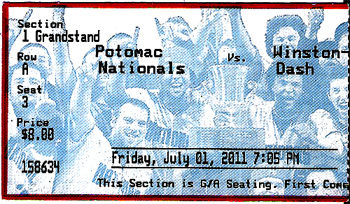 The P-Nats, as they’re often called, provide a standard gameday program for free. 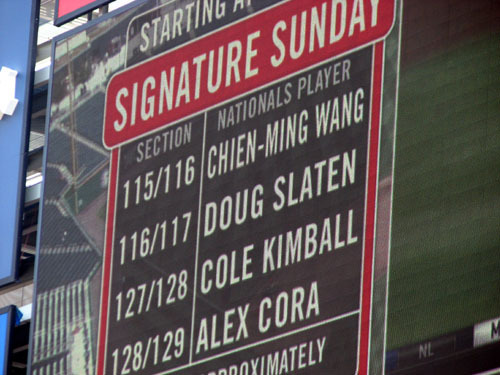 It’s got all the things you’d expect, but a few interesting pages are the breakdown of the Washington Nationals’ farm system and a look at the Carolina League franchises. Additionally, this program isn’t overly laden with ads. 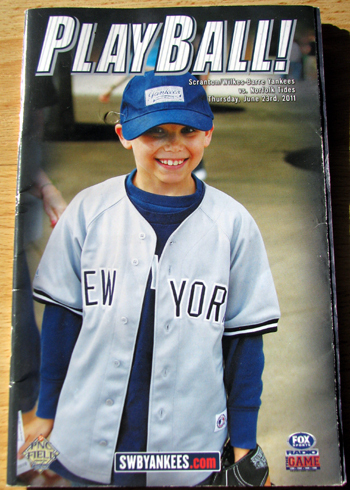 The big perk to the S/W-B Yankees’ “Play Ball!” program is like the IronBirds, it’s printed for the game you’re attending. 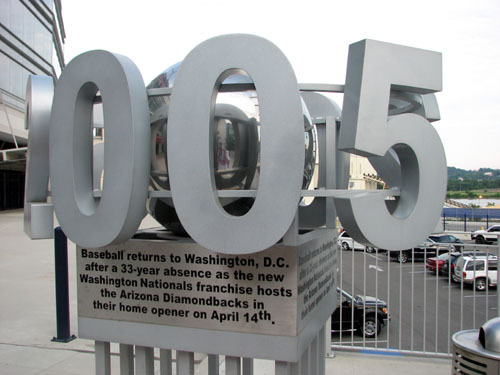 Although it’s relatively short in length, “Play Ball!” has an interesting game preview, a “This Date in Yankees History” page and an interesting section about the players to watch from the visiting team. It’s a toss-up whether Toledo or Rochester has the best program I’ve seen so far on my travels. 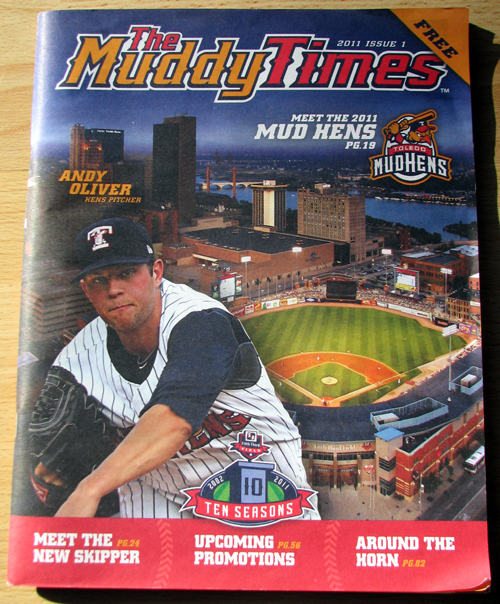 “The Muddy Times” is amazing, and might get the nod over Rochester because it’s free. This book is giant, measuring 9.5 by 12 inches and numbering 112 pages. The pages are newsprint, but they’re thick and in full color. I love the cover shot, as well as the in-depth player and coach profiles, the 2010 season review, some good player Q&As and an awesome two-page spread on the Detroit Tigers’ top 10 prospects, written by Baseball America. This is the type of program you’d spend $5 on and still feel as though you got your value. 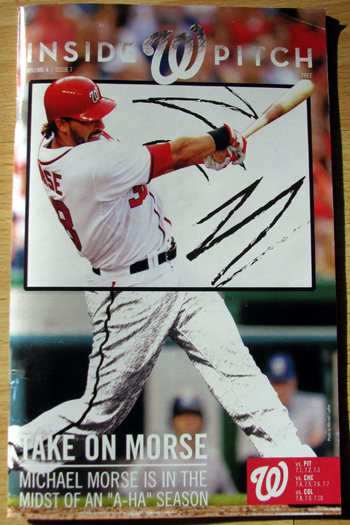 Like Cleveland, the Nats hand out a free game program to complement their paid program. “Inside Pitch” (which is the same title as New Hampshire’s program) is printed on thick paper, which is a definite upgrade over the newsprint in some programs. 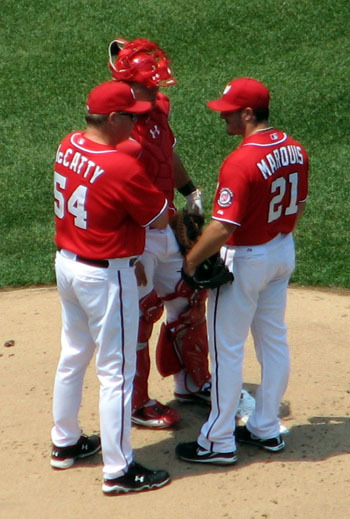 This one has an extensive Nationals Park fan guide, a guide on how to score a game and even two removable player cards (Jason Marquis and Michael Morse). 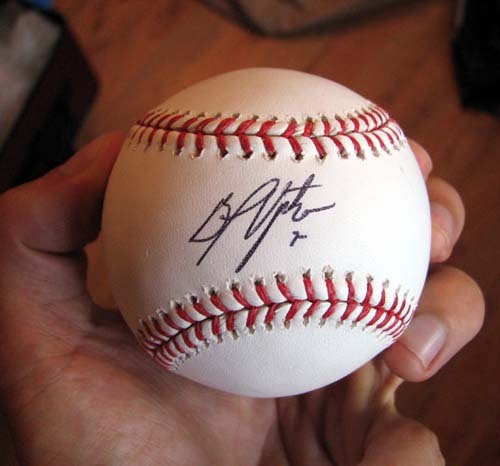 Over the last two days, I’ve posted autographed balls from 1970 AL MVP Boog Powell and two-time National League All-Star Justin Upton. 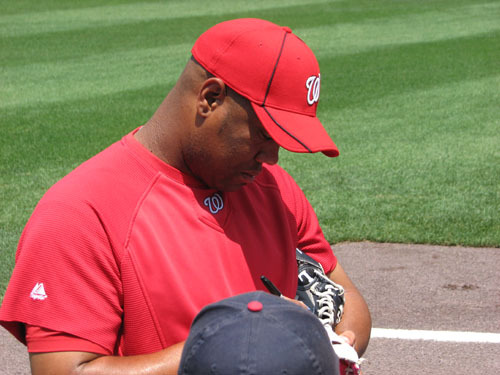 Today, I’m posting the third autographed ball I got on my most recent road trip for The Ballpark Guide, which took me through Pennsylvania, Maryland and eventually to D.C.
B.J. 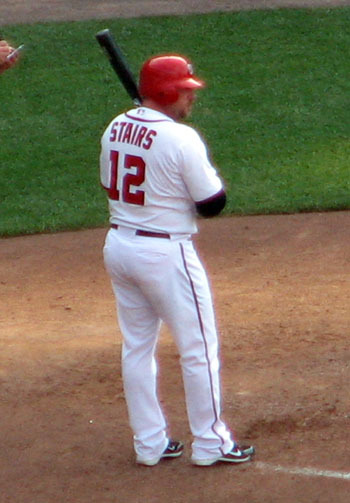 hasn’t been an All-Star like Justin, but he has hit for the cycle, doing so back in 2009. He’s played his whole career with Tampa Bay and I’ve seen him play live a number of times. 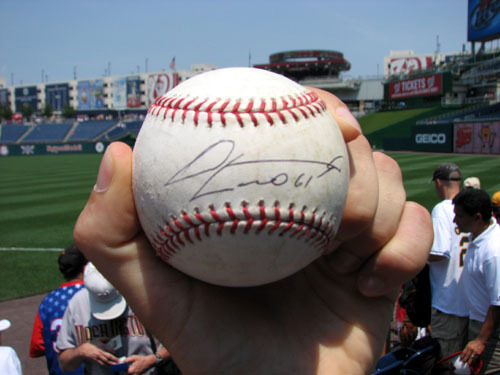 I bought this MLB-authenticated ball at Nationals Park, just as I did with the one signed by Justin. Both balls were a good deal, and I thought it’d be neat to have signatures from both guys. 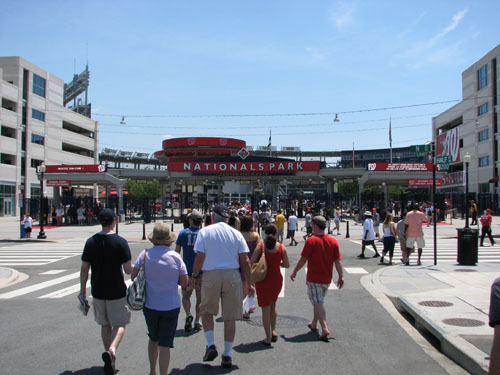 Before my second Washington Nationals game, I decided to walk around the outside of the stadium to take in the sights. 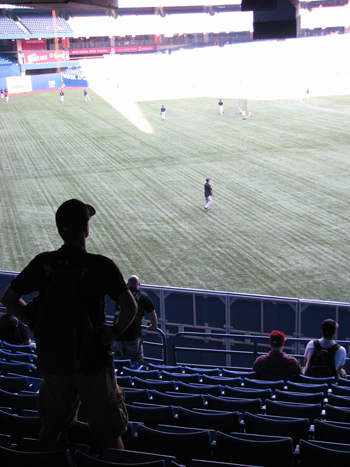 A day earlier, big crowds prompted me to quickly get into the stadium, but on July 3, I had more time. I love unsolicited opinions. 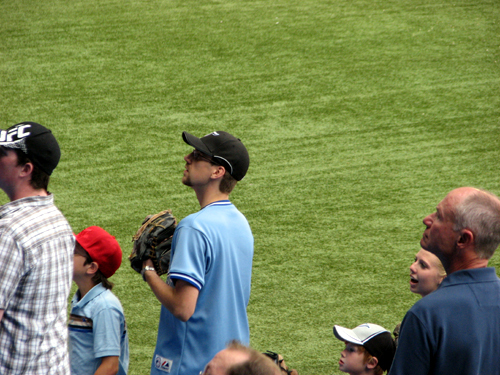 The guy then told me (disgustingly, I should add) what a horrible manager Davey Johnson is and how the day’s loss was on him. 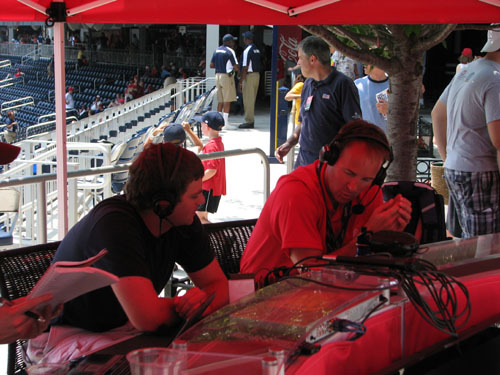 He said Johnson’s not ready to manage in the Big Leagues and how Jim Riggleman was slapped in the face by Washington management. I said I understood what he was saying, but giving the team an ultimatum can come back and bite you in the hind parts. The guy completely flew off the handle, telling me I was wrong and how when you’re “only” making $600,000, the team’s taking advantage of you. “He showed them,” the guy said. 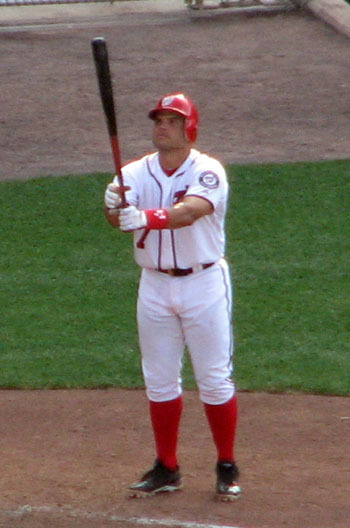 I pointed out that now that Riggleman is making $0, the team may be having the last laugh. The guy was starting to ramp up his rebuttal (while his wife stood there and blatantly rolled her eyes) when our shuttle bus came. Saved! 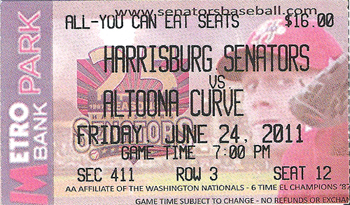 With my visit to the nation’s capital now in the books, I had one last stop on my 12-game, 12-day road trip: A visit to Binghamton, NY, to watch the AA Mets. 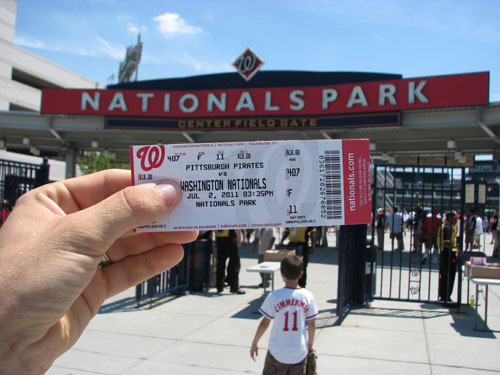 A day after my disappointing visit to Pfitzner Stadium to watch the Potomac Nationals, I was excited to watch the parent club Washington Nationals. 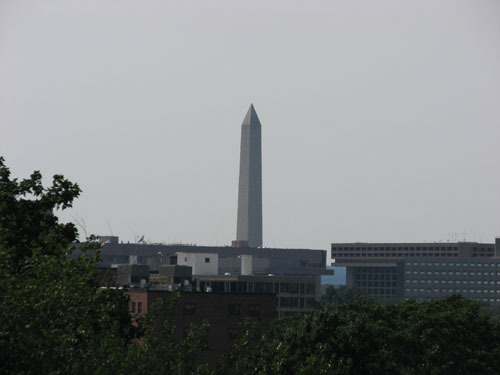 I was staying for three nights in Alexandria, VA, just across from D.C. 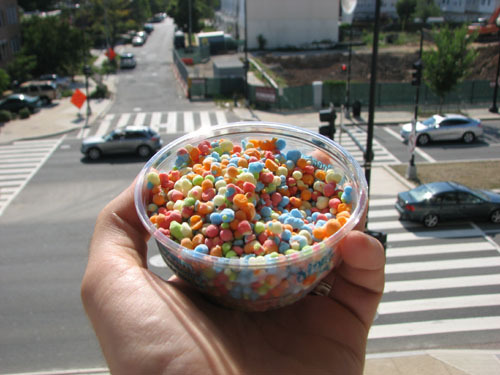 When I drove through D.C. to get to my hotel, I noted how bad the traffic was. (I’m sure it was worse because of the Independence Day long weekend.) 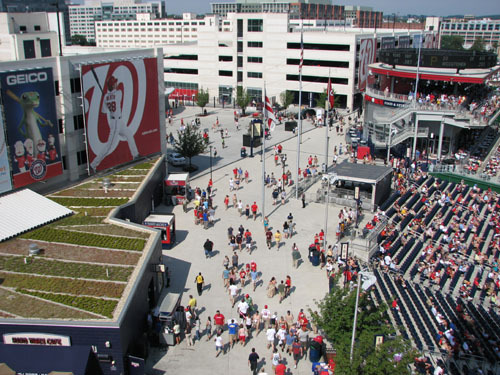 As such, I decided to take the D.C. Metro to Nationals Park instead of try driving. As it turns out, the metro is absolutely the way to go. It’s very clearly signed, and even though I’d never attempted it before, I didn’t have any problems. 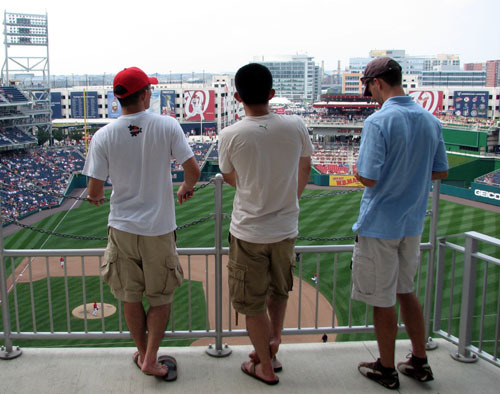 Even if you’re tentative to try it, go for it — there are scores of people wearing Nationals jerseys, so if all else fails, you can just follow a group. 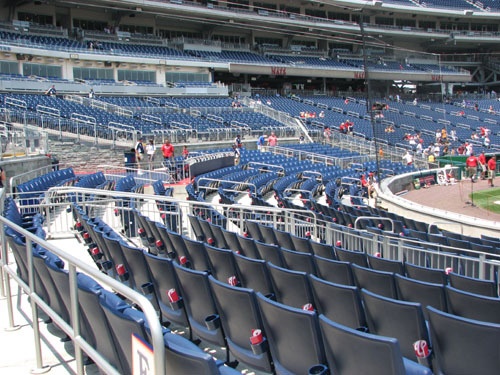 Yep, George Washington, Abe Lincoln and a ton of baseball fans. 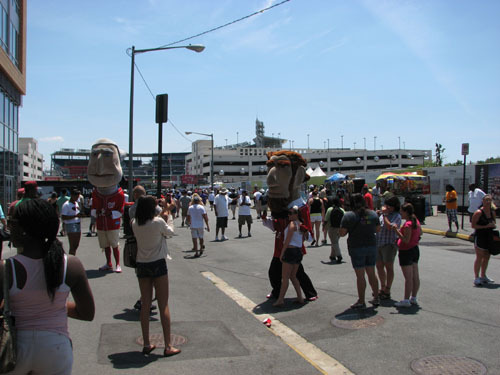 Nationals Park is in the background. 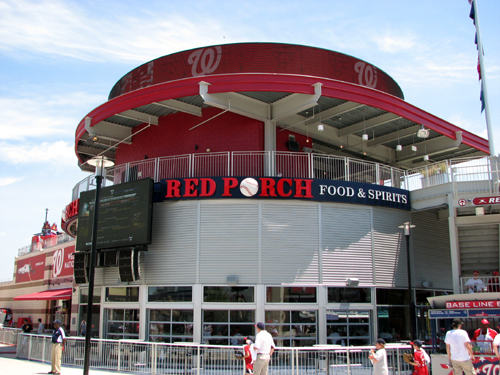 As you approach the stadium, you have to pass by several vendors hawking water, peanuts, Nationals apparel and the like. 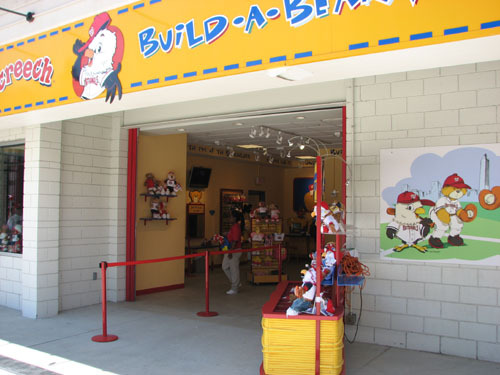 They offer some great deals; $1 water, for example, instead of paying $4 inside the park. I didn’t have my ticket, so I had to get in line. 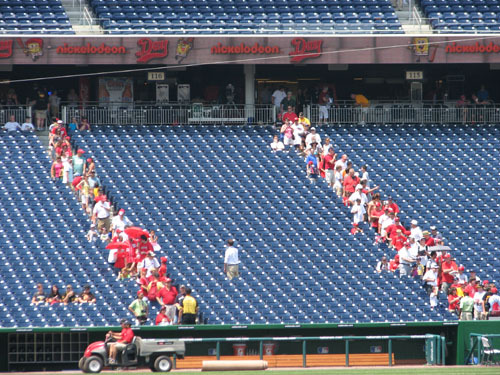 Today was a double-header AND a T-shirt giveaway, so the crowds were pretty wild. 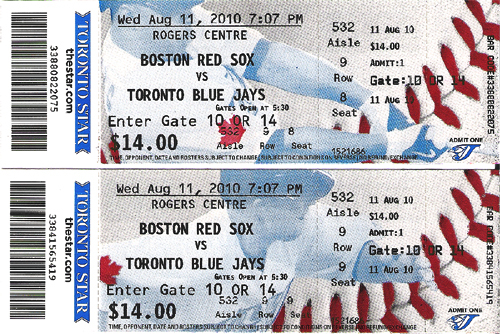 A few days earlier, the team started selling $2 tickets for the game online. “I’ll buy one later,” I thought. Of course, the tickets were sold out when I checked later, and now, standing in line, I heard people grumbling that the cheapest ticket was $45. UGH! 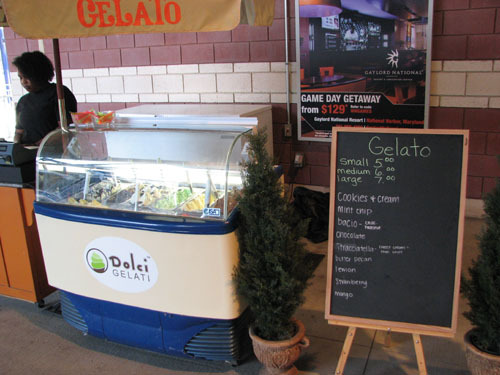 Beside the batting cage, there was a speed throwing station. 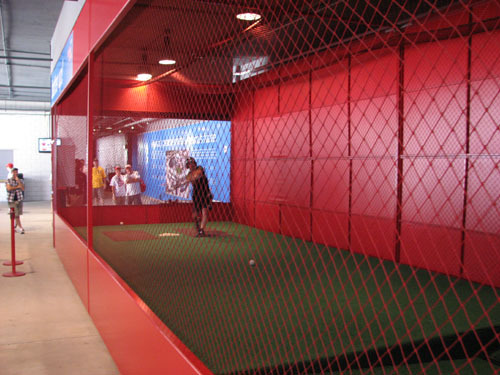 Both were neat, though I’d suggest watching a couple rounds of someone else batting if you plan to step into the cage. 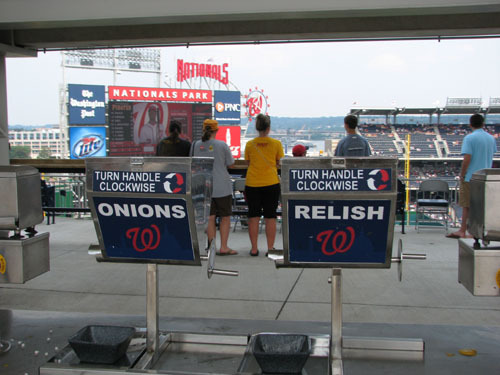 When I watched, the machine was horribly uncalibrated; one guy had three pitches sail over his head, another guy was beaned on the arm and yet another had one of his 10 pitches go through the strike zone. It all made for a rather interesting spectacle. And the poor guy running the cage just stood there shaking his head. 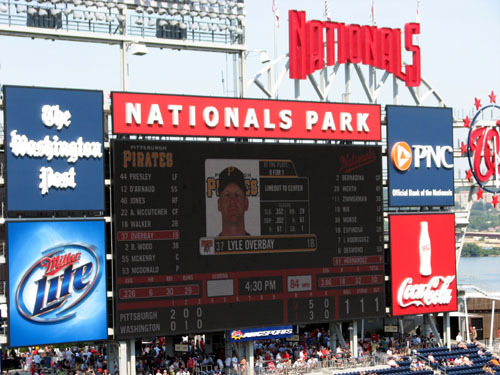 It’s hard to believe, but the day’s game between Pittsburgh and Washington featured two clubs with decent records. Both were around .500, and trying to climb higher; it’s a big departure from where these teams usually are. Anyway, awful! But Kudos to this team for somehow getting things done on the field. 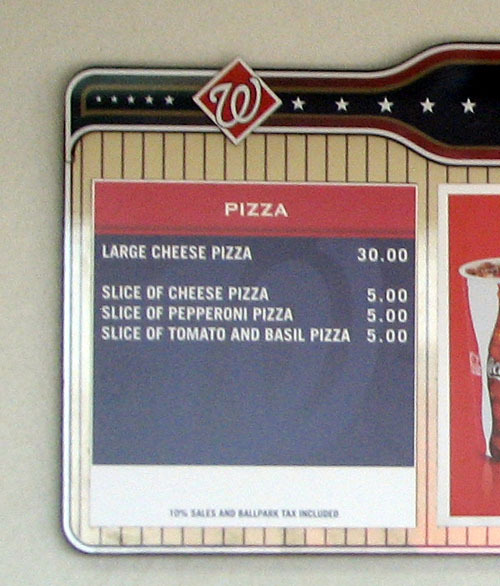 Gotta love ballpark food prices, huh? And as good as it looks, it honestly wasn’t all that great. 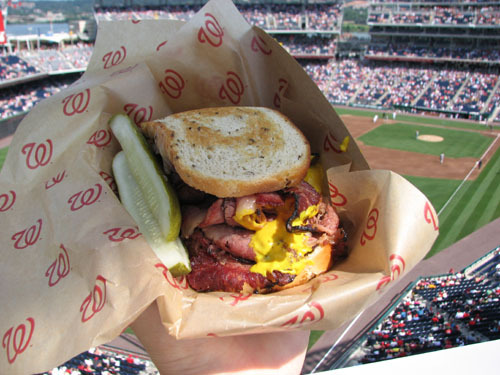 The pastrami didn’t have much flavor, but live and learn. I’m still glad I tried it. 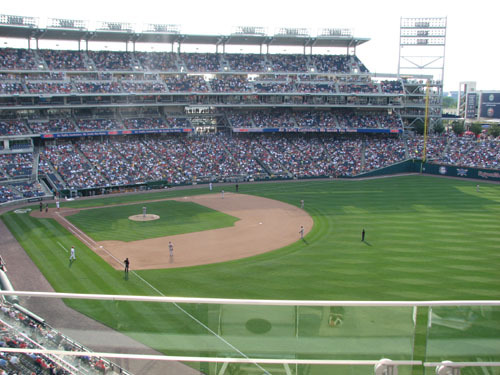 If you’re not focusing on the stadium itself, you’ve got an amazing view from the upper deck of Nationals Park. Recognize these landmarks? 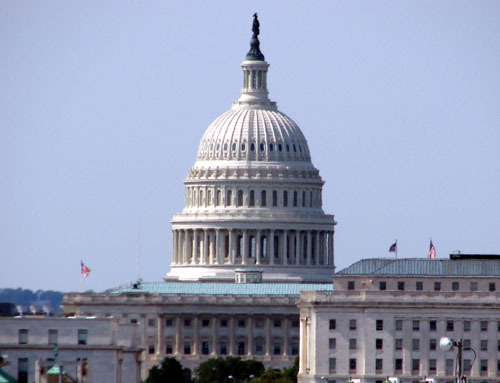 Yep, it’s the United States Capitol building and the Washington Monument. 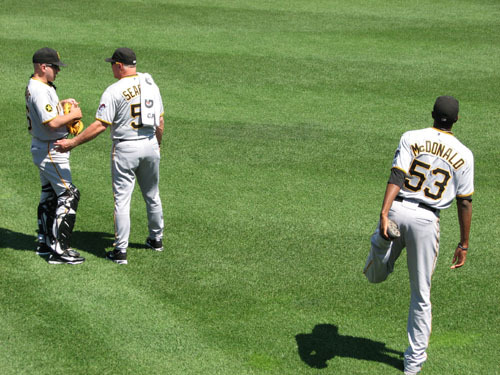 The Pirates won game 1 and Washington took game 2, and I had a great time at the double-header. 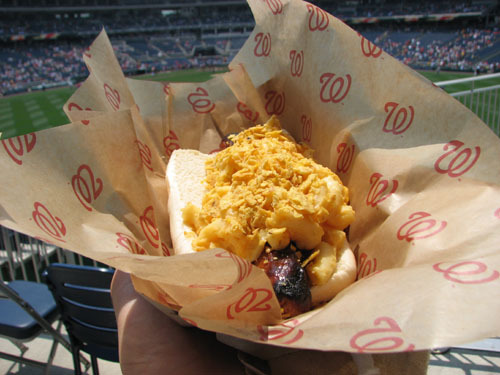 A day later, I’d be back in D.C. for one more game on my road trip ….